The Equiery an information and advertising publication for the Maryland equestrian community published by the Maryland Horse Council. The Equiery is published 12 times a year (monthly), and is distributed, free, in tack shops and feed shops in & around Maryland. For more information on equestrian services in Maryland, please contact us 1-800-244-9580 or 410-489-7826 or info@equiery.com. To find a copy of The Equiery near you, check our Equiery Distributors. Calendar of Events: featuring hundreds of events for the current & upcoming months. Our “Out & About Maryland” monthly column features news bits about local horse people. Monthly features explore and celebrate the diversity of horse activities within our area. Above all, The Equiery is primarily an advertising circular, with the most complete and comprehensive array of choices and information in the state. You will not find more information on horse businesses in Maryland available anywhere. With its easy-to-read layout and comprehensive information, barn managers and horse owners find The Equiery a “must,” keeping it right by the phone as their essential reference source. With our toll-free 800 number, The Equiery is Maryland’s “information warehouse.” If readers don’t find the information they need in an issue of The Equiery, they call us. We have helped callers find all sorts of services, such as farriers, manure removal, accreditation programs, special interest organizations, breed owners, stallions, tax and medical information, carriage services, rental stables, and much more. Everyone! With its practical format of useful information, The Equiery appeals to everyone from the international professional to the amateur rider, from trainers to barn managers, from veterinarians to pleasure riders, competitors, lesson students, and even kids. The Equiery‘s readers range from combined training and dressage riders to hunter/jumpers and carriage drivers; from competitive trail riders to polo players; from foxhunters to jousters; from the well-established horse person with a stable full of horses to the enthusiastic beginner. Equestrians moving into the area find our membership services extremely helpful in easing the transition for both them and their horses. Often referred to us by various national and local associations, the state government, real estate agents, tack shops, etc., we help these newcomers feel welcome to our state and help them settle in their horses. We say “ek-wee-air-ee,” but we have heard “eek-wee-air-ee,” “ek-wary” and numerous other creative interpretations. So, we have a saying in the office: “We don’t care how you say it, just so long as you continue to say it!” Truth is, no matter how you say it, folks seem to know what you are talking about. What does “Equiery” mean? Is it a real word? Yes, it is a real word, but it did not exist before we created it, and our parent company, Tuttle Enterprises, Inc., owns all the rights to the word. The base, “equi” is from the Latin for “horse.” The suffix “ery” is from the Latin “-arius” and has several meanings, including a collection of something, such as crockery, finery, jewelry (and in The Equiery , you will find a collection of horses), and a place to buy or sell something, such as bakery or saddlery (people buy and sell horses and horse related things through The Equiery ). Blending the power of advertising in print and online! The Equiery® is pleased to be part of the horsetrader.com Alliance! The Horsetrader.com Alliance is the internet’s top horse-for-sale website, providing a coast to coast network of print and online resources for growing your business. Your listings that appear in print and online in The Equiery will also appear on horsetrader.com, and you can enhance the online versions with pedigrees, links to your personal website, or even a video. The horsetrader.com alliance was founded by the California Horsetrader. Since 1979, California Horsetrader has been California’s BEST Marketplace and mentoring publication to The Equiery, established in 1990 and Maryland’s BEST marketplace. Like The Equiery, the California Horsetrader is distributed for free in more than 1,000 horse-related businesses in California and adjoining parts of Oregon, Arizona and Nevada. 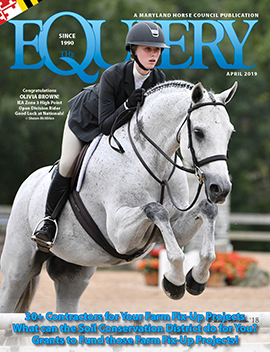 www.equiery.com is an on-line publication, advertising and information service provided by the Maryland Horse Council, trading as The Equiery. We can be reached by email at info@equiery.com. Maryland Horse Council, t/a The Equiery is the sole owner of the information collected on The Equiery site. We will not sell, share, or rent electronic information to others in ways different from what is disclosed in this statement. The Equiery collects information from our users at several different points on our Web site. In order to place classified advertising or subscription orders on The Equiery site, a user must provide an email address. This information is used to contact the user or client in regards to that order or for future orders. All credit card transactions are processed securely for our merchant bank. Information is not stored, retained, or used by them. Maryland Horse Council/The Equiery takes every precaution to protect our users’ information. When users submit sensitive information via the Web site, that information is protected both online and off-line. When our registration/order form asks users to enter sensitive information (such as credit card information), that information is encrypted and protected with SSL encryption. Our clients will occasionally receive site and service announcements. We communicate with the client to provide requested services and in regards to issues relating to their account via email, phone or mail. Those who wish to be removed from a mailing list thereby no longer receiving further mailings can do so by clicking on the Unsubscribe link at the bottom of the email message.